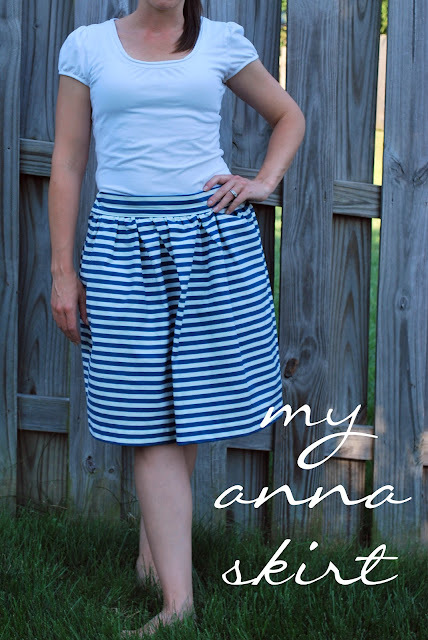 A few weeks ago I saw Anna's (from Noodlehead) tutorial for this skirt over at Crafterhours for their skirt week. Instant L.O.V.E. I knew I was going to make this skirt. I pinned it immediately...heart Pinterest. 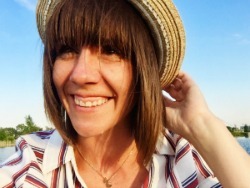 At the beginning of Spring, I had declared that this Summer was going to be a skirt summer. Alas with all the moving, I had yet to make myself a single skirt I could wear. I had everything I needed to make this skirt, so I whipped it out in an afternoon. Since my fabric choice was this lovely patriotic stripe IKEA fabric, I made sure to get it done before our trip to the fireworks. I seriously love wearing this skirt. I may have worn it three times since making it. I have paired it with white sandals and red-painted toes, yellow ballet flats, or my bare feet while cutely parading through my house...after all that is the only way to parade through one's home. there will be another skirt. It looks great! I think it would look good with a pop of red somewhere like a belt a red flower or necklace. You look great in it! I love your take on this skirt, very nautical. Perfect summer skirt. Looks awesome! So many options with that great fabric. It turned out so cute. I just love it! I am going to go pin it right now....I love pinterest too! I actually used a heavy fabric from IKEA. It was what I had on hand. It made the skirt a little stiff, but still wearable. I would not use a knit for this skirt unless it was stiffer because you want the skirt to hold some shape. Cotton is probably best.